IntoWork Australia is a leading national provider of services that support economic and social participation, with offices in over 95 locations across the country. 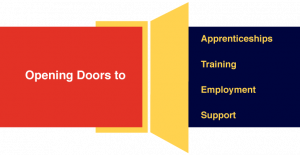 IntoWork Australia is a national group of 10 businesses, opening doors to apprenticeships, training, employment and support, with over 30 years’ experience and knowledge in providing short term labour hire and permanent recruitment solutions. We have over 40,000 candidates in our database and we are training in the order of 50,000 candidates a year through our group of companies. and training, short courses, college and school courses. labour hire, including Transition Services and Disability Employment Services. people and the communities we work with.